Who could it be? Where could it be? We’ve heard on the grapevine that another one of Channel [V]’s sneaky little Guerilla Gigs will be happening on Thursday this week. It’s set to be in Sydney – of that much we’re sure, but when and where? And with whom? We’ve heard “big Aussie act”. 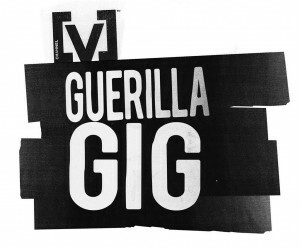 But things become a little clearer when you visit [V]’s FACEBOOK PAGE, where they’ve pretty much dropped the easiest of hints as to who’ll be taking the Guerilla Gig stage.